Disney Epic Mickey was released on November 30, 2010, in North America with a MSRP of $49.99. Disney Epic Mickey was developed by Junction Point Studios, and published by Disney Interactive Studios. The game has an ESRB game rating of "E" for "Everyone", with the only content listed for parents to be aware of being "Cartoon Violence". 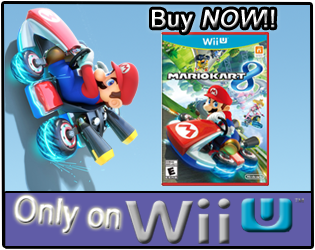 It has taken Disney Epic Mickey 28 days for its game-play hours to appear on the Nintendo Channel since it released. 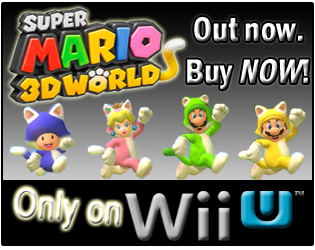 How many hours have Wii owners reported spending in Mickey Mouse's new adventure in those 28 days? Let's take a look! Does Mickey drink coffee? I have no idea! Hours shown above are for the United States only, not world-wide. 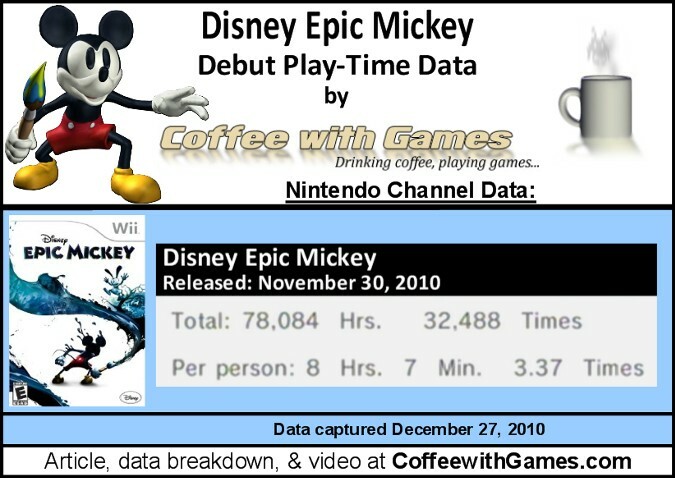 Disney Epic Mickey has 9,640 Wii owners reporting their game-play hours on its debut, on the Nintendo Channel. 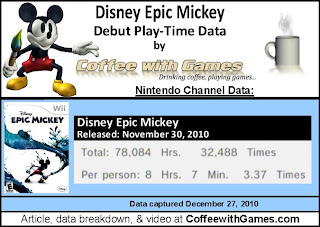 Disney Epic Mickey has 78,084 Total Hours of game-play hours reported on its debut, with an average of 8 Hours 7 Minutes "Per person" reporting data. Disney Epic Mickey's average reported play-time per session is just over 2 Hour 24 Minutes. Disney Epic Mickey's Amazon.com sale rank is #22, and it is currently selling for $39.99. Disney Epic Mickey's review score average is 71.83%, based on 40 "professional" reviews on GameRankings.com. Disney Epic Mickey has a 3.5 out of 5 Stars rating on Amazon.com, based on 75 customer reviews. What would you rate it? I haven't played Disney Epic Mickey, and I didn't receive it for Christmas, but I really do want to play it. I read and watched many of Warren Spector's interviews on Disney Epic Mickey, and he always seemed to really be enjoying the development of the game and talking about it. A lot of the "negatives" on the game seem to be issues with the game's camera controls, but it does seem some players can adjust to them, and still find Disney Epic Mickey very enjoyable. I was honestly surprised to see Disney Epic Mickey have so many varying "professional" review scores, especially considering how open Warren Spector seemed to be talking about the game. I have a few games I'm going to try to get caught up on from my backlog, but hopefully I'll give Disney Epic Mickey a try sometime in 2011. Have any of you played and completed Disney Epic Mickey? If so, about how many hours of game-play did it take you to complete Disney Epic Mickey's story mode? If you have played it, but even perhaps not completed it, do you think the camera controls in the game are a big issue that should be fixed for any possible sequel? Will this be a rental for you? The camera can be problematic, but I've never played a 3-d game that didn't have some camera issues. The game is certainly worth putting some effort into learning the camera. I only missed my jumps a couple of times. There are very few bottomless chasms, most falls drop you into pools of thinner, which Mickey quickly jumps out of; there are five hit points given to Mickey, extra points are very abundant, Mickey will readily grasp edges and there is a double jump. Minor camera issues aside, this is a fantastic and engaging game. I've talked about it a lot in gonintendo.com comments, so you probably know most of it already, but I've finished the game in about 3-4 sessions and tallying up to a bit over 18 hours. The camera has more issues than in some other games, but as already said, nearly no game of this type gives you flawless camera even if the game is a pure platformer or action game. Actually the things that bothered me more were not technical ones, but nothing was enough to make me stop playing. I only ended my sessions because it was time for sleep. Honestly, I had high expectations for the game and I could've easily come away disappointed with the issues that Epic Mickey has, but regardless of them I was gripped tight and enjoyed the special mood and sense of exploration it offers. It does not feel like quite any other game, if you have an open mind and don't want to play it like Mario Galaxy and give up once it doesn't work out like that. Personally I feel that the hype caught those people that love to go all up in it and made them overly hate it once they found out it's a very different kind of game. Not to say that I wouldn't improve and change a lot of things, but I think the reactions to the game are like going into Deus Ex expecting Doom and then writing a review how it is the worst shooter ever. I could talk about this more in-depth for hours, but one thing I want to say is that you can see that a few things were meant to be done differently, but for some reason they were changed. Mainly the fact that Mean Street doesn't stay the way you paint or erase it and that being able to buy paint/thinner supplies in stores was made redundant by giving the player an endless supply through the resetting scenery. I'm 100% sure this was not an early decision, but shoehorned in later for difficulty or balancing reasons. I remember Spector often said that the player will have to decide if he wants to spend his resources on restoring the Wasteland and it would've made perfect sense if they did not change to the limitless supply. That would also very much validate that you get a bigger bar for paint/thinner depending on how you deal with certain bosses. I would really love to talk to Spector like this privately and ask him about certain design choices and if he was pressured by the stamped in stone release date in some way. Still, it's a game I can only recommend and hope that it sells well enough to give Spector whatever he needs for his next game for Disney. I, like you, really want to play this one, but haven't had a chance to yet. Good comments by Anonymous - good to know how you felt while playing it, and those thoughts seem to mirror a lot of those I saw online as well. I've finished the game in about 3-4 sessions and tallying up to a bit over 18 hours. The camera has more issues than in some other games, but as already said, nearly no game of this type gives you flawless camera even if the game is a pure platformer or action game. P.S. : I had to cut my comment in half because it was too big to be posted. In case you want to see more on this topic, I'd be glad to post more or talk via mail. I restarted Epic Mickey due to making a decision I wasn't happy with, and got stalled due to the holidays, but I'll play it again. I think a sequel would be good, but I want the Scrooge McDuck game even more. Doubt it. Either a purchase, or I may get to borrow it. I'm glad to hear from gamers that are enjoying the game, and give some other perspectives on it. So many games, so little time! That seems to be my excuse for not playing a lot! Is the exploration sort of like how Super Mario Sunshine was? Also, thanks for the comments on it, and how long it took you to complete the game. It really does seem like it's a solid game, if you go in with an open mind. I personally didn't enjoy Super Mario Galaxy as much as I was expecting, after all the stellar reviews it received...but I usually enjoy games for the fun they provide, even if they have some issues that others can't get over. You didn't feel like just completing the game even with the decision you had made? Or, were you not very far into it? I've heard the different decisions can affect different outcomes, but I haven't heard a lot about those. Thanks everybody for the comments and feedback! I really do appreciate the time you all put into them and hope your feedback may help some people, like myself, make decisions regarding the game! This is not surprising that Mickey will be in video games. "Steamboat Willie" was used as a first-class video game based Mickey Crazy.